I stare at the glorious handcrafted world of Blitz Games' Paper Titans for hours, lazily rotating each colorfully cobbled-together stage. I would gladly take a large stack of proto-form Titans, popping them out of their paper prisons and folding them to life with a flick of my finger. This striking setting cries out for interaction and exploration. What it gets is a great deal less exciting. I want to wander around with these pretty paper people, pulling at tables or tearing at loose ends to reveal secrets. 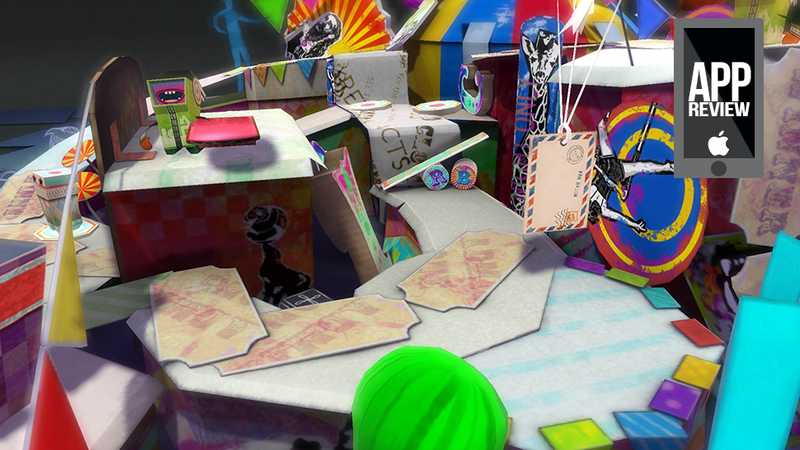 I want levels to transform like discarded pop-up books. The darker side of me would love a little flame, nipping at the heels of our heroes as they rush towards a goal. the lighter side wants crayons. Instead, we have a platform puzzler that tasks the player with gathering three stars placed about each level, followed by an envelope with lipstick on it, as romantic and dreamy as the gameplay is not. We start with Collectors, whose job is to collect the stars. Then comes the Thrower, who can toss other Titans to reach out-of-place areas. Then comes the Exploder, who can destroy obstacles to clear paths. It's almost a mild real-time strategy game, emphasis on the mild. Paper Titan's whimsy is its strongest asset. No other mobile game has quite the fluttering, heart this one does. No other game links you to a page where you can download, print and build exact replicas of its colorful characters. No other game looks quite as wonderful as Paper Titans, but many of them are much better at keeping me entertained.